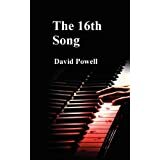 I picked up a Kindle copy of The 16th Song by David Powell from Amazon because I recognized the author’s name from a peer-critique writers site we both belonged to. Though this isn’t a genre I typically choose to read for my own pleasure, I knew I’d enjoyed other work by David Powel and decided to take a chance. What an awesome story. I read on average anywhere from three to five novels a week. If one doesn’t hold my interest after the first quarter or so I usually don’t bother to finish it. The 16th Song reached out and grabbed my attention right from the very first page and didn’t let go until I turned the last page. Completely hooked, it became a matter of my “needing” to finish because I had to know what would happen to our main character, Peter Daniels. We all carry secrets inside, and Peter has one huge one. He is a young, talented musician who happens to find himself in the right place at the right time while in Paris, France. When a popular group of musicians finds their piano player put out of commission with a broken finger, they allow Peter to step in and play in his place. Peter is ecstatic to find himself handed this great opportunity, not only for the chance to learn from more experienced musicians, but to earn a little money while he’s at it. Though he is a nice guy and doesn’t wish anyone harm, he can’t help but be happy when the player he replaced is deported back to the States. Now, not only does he get to continue playing with his new friends, he also finds a great new place to live in the old player’s apartment. Inside the apartment he finds a suitcase filled with new music written by the American he replaced. When he learns later that this musician commits suicide he is faced with a real moral dilemma: keep the music and pass it off as his own, or turn it in to the authorities and perhaps see it destroyed. Of course there is a lot more involved than what I can fit in a review, but I understood the power of the temptation he is faced with. I think this is what held my attention throughout the story, wondering what I would have done if placed in Peter’s situation, not only where the music is concerned, but in other areas of his life. Since I don’t want to give away any key plot points, I’ll stop here and just say this is an excellent story, one of those pleasant surprises I occasionally am lucky enough to pick up. I’m fairly sure this is going to stick with me long after I’ve finished it and will probably be one of those I’ll read over again in a few years. Posted by Denna Holm on March 28, 2013 in Archives and tagged five star review, music, musician, Romance, sexual tension.